16:25 Britain, just go. Martin Schulz, the president of the European parliament, has said that he wants Britain out as soon as possible, rather than wait for Mr. Cameron’s replacement as Prime Minister to be appointed at the Conservative party conference in October. 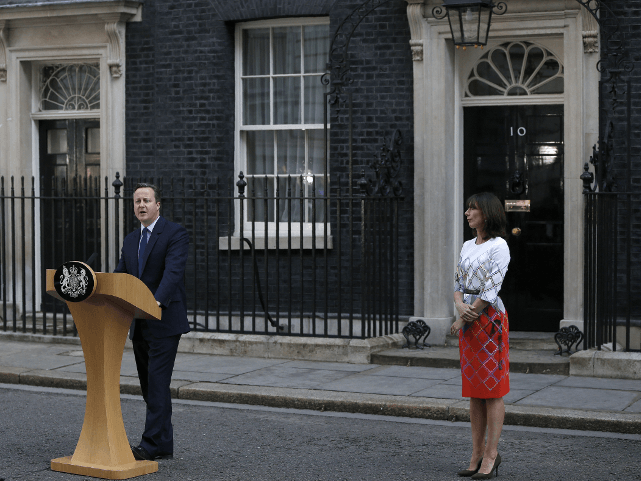 Mr. Cameron said that he wished to wait for his successor to trigger Article 50, and carry the UK through the process. However, Mr. Schulz said today: “Uncertainty is the opposite of what we need,” and that “a whole continent [cannot be] taken hostage because of an internal fight in the Tory party”. Mr. Schulz’s comments follow an earlier joint statement of Donald Tusk, President of the European Council, Jean-Claude Juncker, President of the European Commission, and Mark Rutte, the President of the Council of Ministers, who stated that the EU expected Britain to act “as soon as possible, however painful the process may be” and that there would be “no renegotiation”. 16:14 The trouble with early newspaper deadlines. 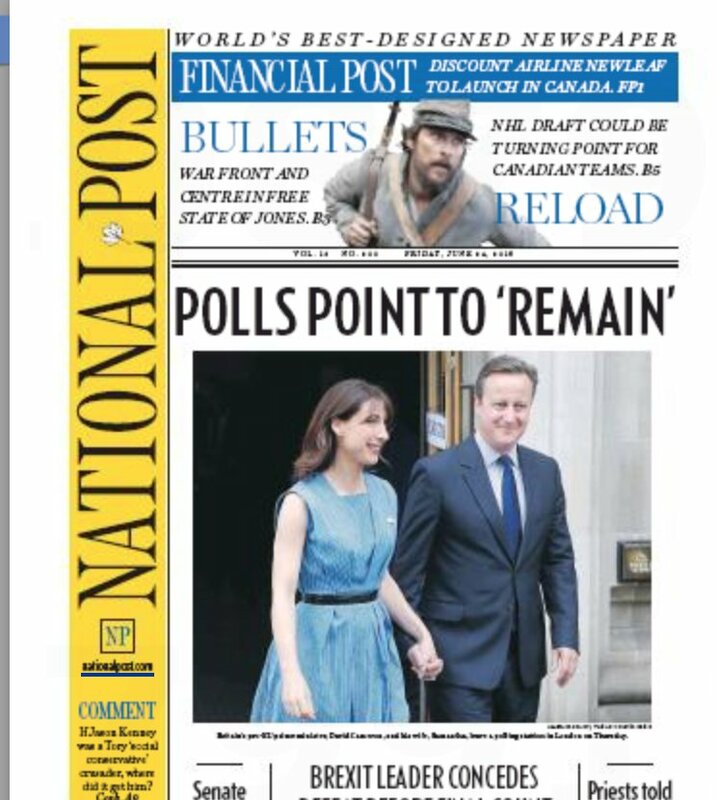 The National Post in Canada made an early call and its front page says it all. 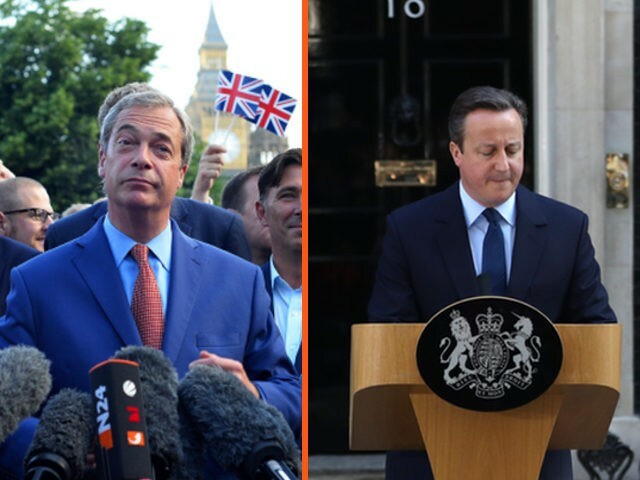 16:02 LISTEN – Nigel Farage and UKIP together helped deliver the stunning Brexit victory. You can listen here as Mr. Farage joins Breitbart radio to discuss the triumph and what it means for the future of the United Kingdom now it stands outside the European Union. European Commission President Jean-Claude Juncker went into crisis talks with European parliament president Martin Schulz, president of the European Council Donald Tusk and Dutch PM Mark Rutte on Friday morning. They called for the UK “to give effect to this decision of the British people as soon as possible, however painful that process may be. Any delay would unnecessarily prolong uncertainty”. Angela Merkel, the German Chancellor, has appealed for calm and urged states not to draw “quick and simple” conclusions. “We take note of the British people’s decision with regret. There is no doubt that this is a blow to Europe and to the European unification process,” she said. But Ms. Merkel said that the “consequences…would depend on whether we – the other 27 member states of the EU – prove to be willing and able to not draw quick and simple conclusions from the referendum in Great Britain, which would only further divide Europe”. Member states should “calmly and prudently analyse and evaluate the situation, before making the right decisions together,” said Ms. Merkel. Ms. Merkel will host talks with French President Francois Hollande, Italian Prime Minister Matteo Renzi and European Council president Donald Tusk in Berlin on Monday. 14:34 The Brexit vote saw plenty of losers on the UK domestic political landscape, but it also claimed the reputation of George Soros. This view from Breitbart News in the U.S. outlines why. 12:34 A motion of no confidence has been tabled against the Labour Party leader Jeremy Corbyn following his failure to corral the Labour vote for the remain camp. Margaret Hodge and Ann Coffey confirmed the move in a letter to the chairman of the Parliamentary Labour Party, the BBC has reported. The motion calls merely for a discussion of the matter at the next Parliamentary Labour Party meeting, due to be held on Monday. It has no constitutional force, and it is therefore up to the chairman, John Cryer, whether he accepts it or not. Mr Corbyn has only been in place since 12 September 2015, winning the leadership of the party in a landslide victory following the resignation of Ed Miliband thanks to Labour’s poor result in the 2015 general election. Despite his widespread support among the party’s grassroots, however, Mr Corbyn is facing a backlash from his party today after a leaked Labour script claimed that Jeremy Corbyn is “uniquely placed as a critical Remainer” to help unify Britain in the wake of the referendum, according to The Telegraph. 12:06 Scottish First Minister and leader of the Scottish National Party (SNP), Nicola Sturgeon, has said that she will push for a second vote for Scottish independence. Ms. Sturgeon spoke this morning following the referendum result, in which Scotland voted 62% in favour of remaining as part of the EU. The First Minister stated that “Scotland voted overwhelmingly to remain in EU… to protect place in single market and protect jobs and investment that depend on it”. Ms. Sturgeon stated that the Scottish cabinet will meet tomorrow to discuss next steps, but that trade and business should continue as normal. 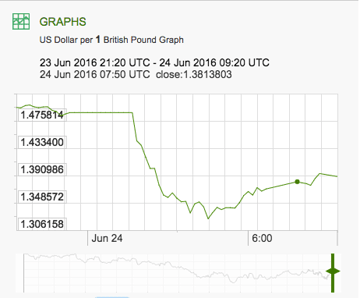 12:00 The Brexit vote has now triggered a counter demand for another referendum. “This is the most extraordinary opportunity of democracy. The process of implementing the wishes of people will be seen as freeing the UK but is also in the interests of Europe. “In voting to leave the European Union it is vital to stress that there is now no need for haste, and nothing will change in the short term except that work will have to begin to affect the will of the people to extricate this country from the supranational system. “As the Prime Minister has rightly said there is no need to invoke Article 50. And to those who may be anxious either at home or abroad this does not mean that the UK will be in any way any less united, nor indeed mean that it will be any less European. We cannot turn our backs on Europe. We are part of Europe. Our children and grandchildren will continue to have a wonderful future as Europeans travelling to the continent understanding the languages and cultures that make up our common civilisation. “Britain will continue to be a great European power leading discussions on foreign policy and defence and intelligence sharing which currently goes on to make our world safer. 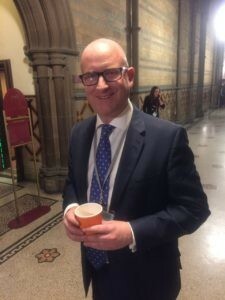 “I don’t think [Brexit will lead to the breakup of the EU]. The [EU] will remain as it is now, so calm, calm, calm… We shall lose also the best army in the common EU defence. “What we have to avoid is [to] think that this is only an alarm for Britain. I do think that the votes when we analyse come out as so pro EU in London anti EU outside London. The EU policy has not been in the favour of all people. This austerity has pushed the EU far away from people in need. I hope lessons have been learned. European Council President Donald Tusk has just given a press conference where he said that the remaining EU member states would stay united. He said that EU law would still apply to Britain during its leaving period. And he said that the method by which Britain will leave the European Union is set out in the EU’s treaties. Atmosphere in Downing St like that before a funeral, media mourners arriving puffy-eyed, nodding to friends, steping with exaggerated care. Australia’s prime minister said on Friday he expects a period of uncertainty and some instability in global markets as Britain was on the verge of Brexit but the immediate impact on Australia will be limited. ‘The impact on Australia immediately, directly, from a legal point of view, will be very limited because it will take some years for the United Kingdom to leave the European Union, to negotiate an exit,’ he told reporters. 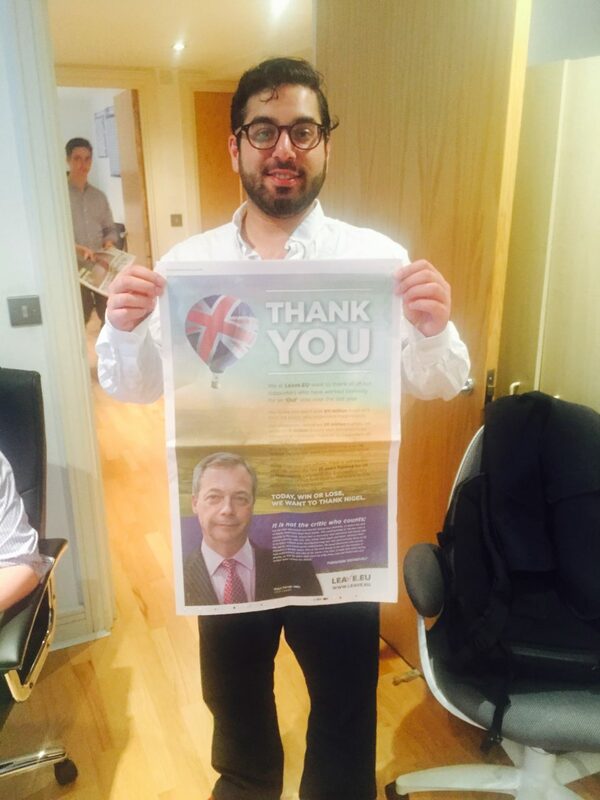 Breitbart London has exclusive footage of the UKIP leader celebrating Independence Day. PVV congratulates British with Independence Day! 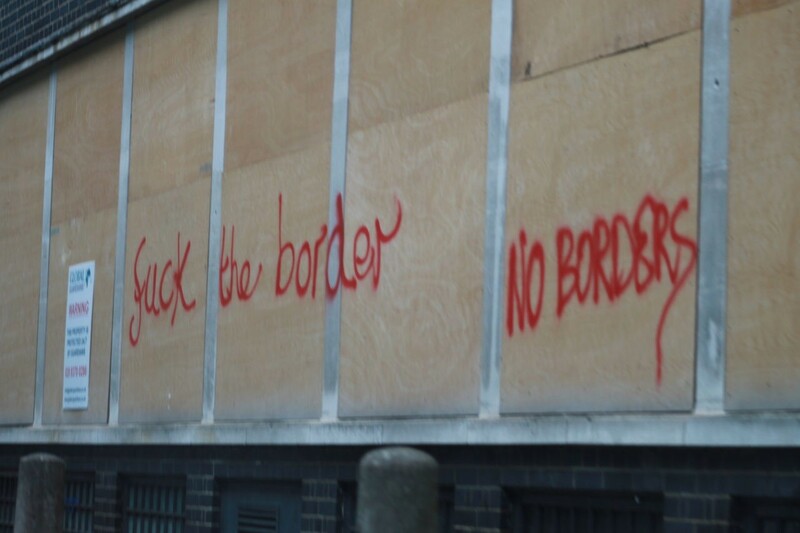 04:22 Rumours that Birmingham, UK’s second largest city, may have voted Leave. If that’s true, game over. 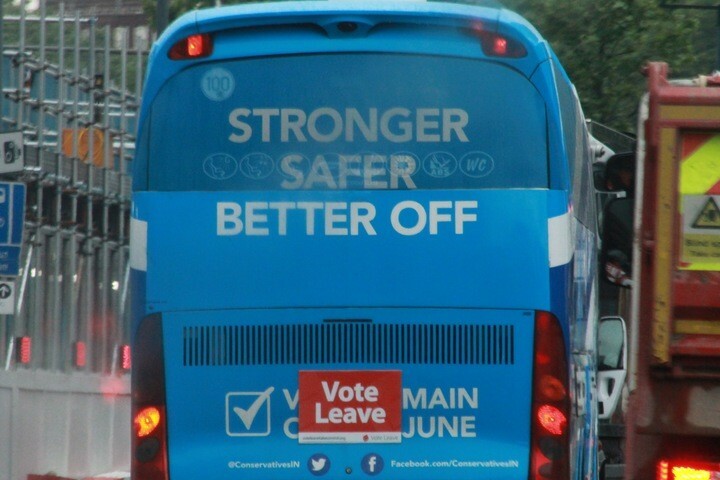 “A lot of the analysts do think that Leave is ahead and Leave will win, which is absolutely amazing if you consider what the British people have had thrown at them from the government in terms of scare stories, fear and intimidation in terms of their jobs and livelihoods — and of course accusations, sometimes of a vile nature, smears. “That people are still voting to leave and have not been shamed into voting Remain is quite an achievement. It goes to show how resilient the British people are in the face of fear and intimidation. Still a chance we'll end up with egg all over our faces. But @ConHome is calling it for Leave. The area is represented by Business Secretary Sajid Javid, who was expected to declare for Leave but ended up backing Remain under pressure from Prime Minister. Text from Labour staffer: "Oh God"
The Labour party is now working on the assumption that leave will win, according to party source. The view in Labour HQ is that, if Britain does vote to leave, Jeremy Corbyn should call upon David Cameron to resign, but senior figures believe that that may prove unnecessary because Cameron may announce his departure of his own accord. Predicted vote share for Remain: 47.1 percent. 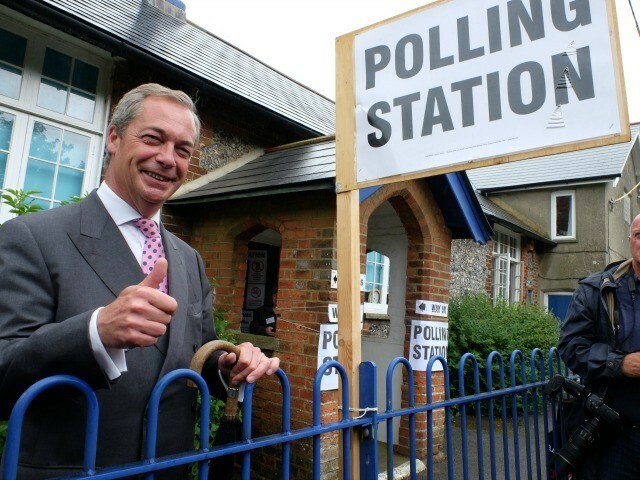 Conservative MP and Brexit supporter Nigel Evans has told Breitbart London that he expects tonight’s result to be close, but that if Remain does end up winning it could be by such a narrow margin that it ends up a very divisive result for the country. Speaking at the national referendum results event at Manchester Town Hall, he compared it to the Welsh referendum of 1997, when 11 of the country’s 22 local authorities voted for devolution, 11 against, and it was enacted with a majority of just 6,721 votes. Richmond-upon-Thames (London) has voted Remain, but Richmondshire (North Yorkshire) has voted Leave. 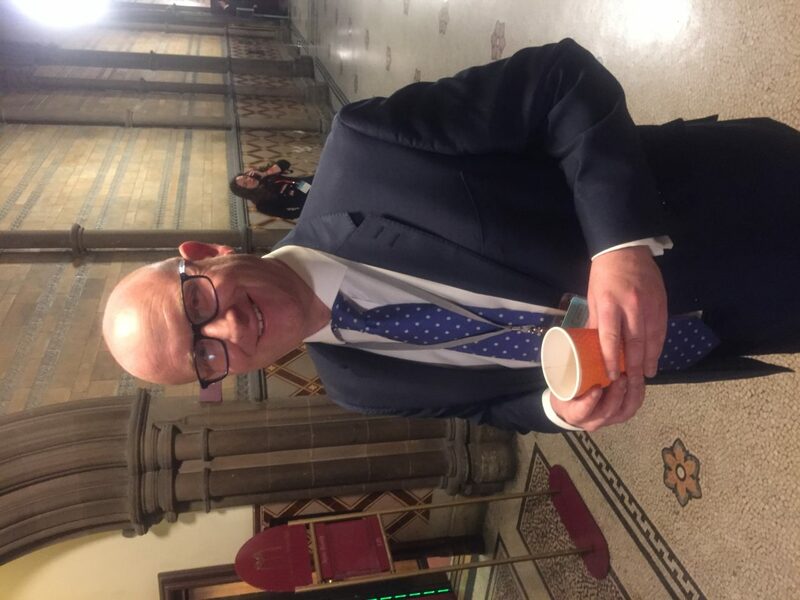 Mr. Nuttall said that he expects the rest of the night to be a “roller coaster” with the overall result dependant on whether there are enough Leave votes in the North East and North West and some other areas to balance out London. He said at the moment it’s looking good, but there are still too few results to be sure of anything. This is big. It was predicted to vote Remain. Vote Leave source: at current rate they're on course for 150,000 fewer votes in London than hoped. But will more than cover that elsewhere. Barking and Dagenham in London is 62% for Leave. The far-Right has done well here in the past. Old fashioned blue-collar voters. 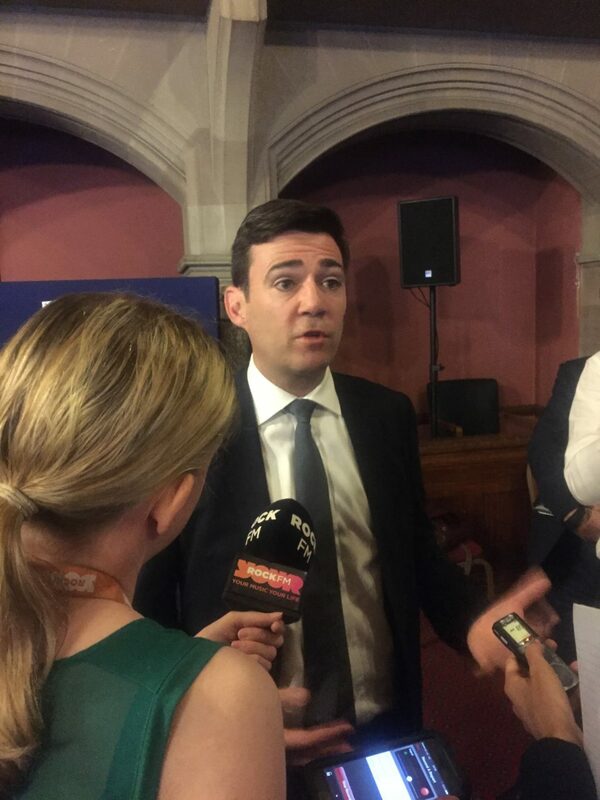 Talking about immigration as Shadow Home Secretary, Mr. Burnham said the country needs to “review how freedom of movement works in practice” and look at the impact it has on public services in more deprived communities. He said this would be a “crucial” element to the UK’s upcoming Presidency of the EU. Remain camp already eating each other. Angela Eagle slagging off govt. You can bet Dave will blame Labour if this goes wrong. Guardian reports that Labour MP Chris Bryant described former party leader Ed Miliband as a “tosspot” at the Remain party. Chris Bryant on Ed Miliband: "I might go and punch him because he's a tosspot and he left the party in the state it's in." Hartlepool ex seat of Lord Mandelson & key Remain figure, gone 70 to 30 for Leave. Project Fear cut no ice. Professor John Curtice says turnout in London seems to be 2 or 3% lower than expected. If so, this is bad for remain. Leave were looking for a 6 per cent lead in Sunderland to be on course to win. They ended up with a 22 per cent lead. 63% Remain 37% Leave – but only a very small population. Could be a good sign for Leave, but too early to say for sure. A very bad result for #Remain in Sunderland might not be catastrophic. We may just be more divided than we thought. But it isn't good. 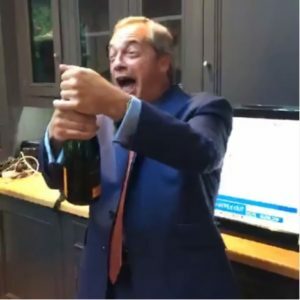 23:46 Nigel Farage has said he thinks, “the Remain side edged it”, thanks to a massive tax payer-funded push to register more than one million young and and extension on the time limit allowing them to do so. He told the Huffington Post tonight: “My view has been the sizeable number of registrations which took place in the 48 hour extension has played a part. Young people are significantly more likely to support the EU, but less likely to be on the electoral register or to turn out to vote. 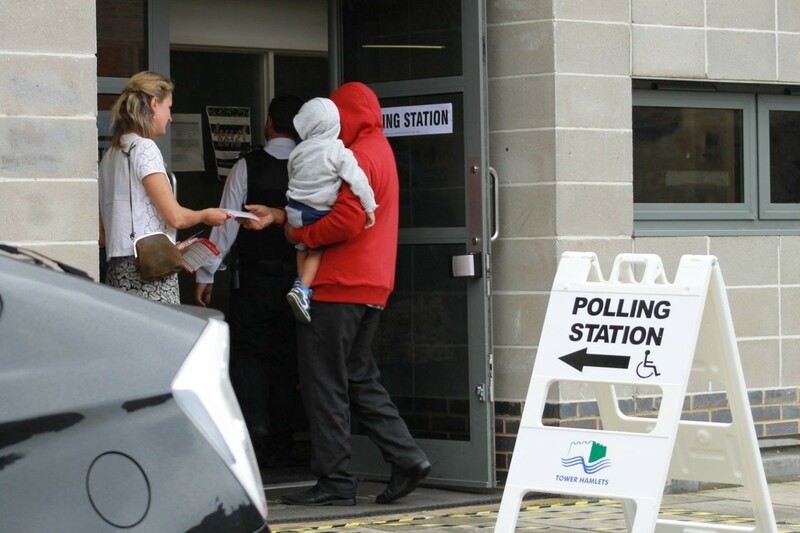 In May, more than 1.6 million people registered to vote in the referendum on EU. 900,000 of them were aged 34 of younger. A last minuet 48-hour extension, ostensibly because of a website crash, allowed thousands more to register after the legal time limit. “If we do stay part of this European Union it is doomed. It will fail anyway. We just won’t be the first brick knocked out. The landscape of British politics has changed forever. Could traditional Labour voters be revolting against their party? Early counting of postal votes in Sunderland suggest a 60/40 split to Leave. 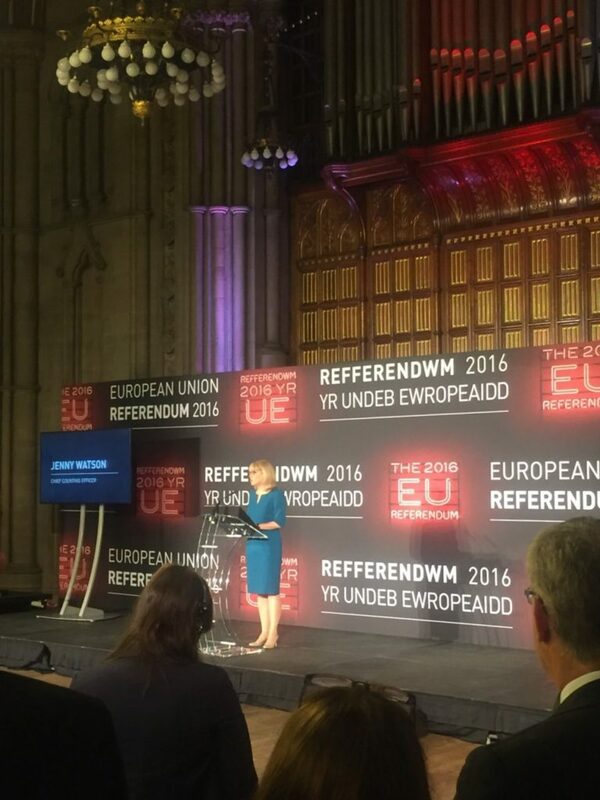 Northern Ireland Secretary Theresa Villiers says “My instinct is that Remain have won”. Basildon (heavy Leave) turnout understood to be floating around 75%. 22:52 High turnout reported in supposedly pro-Leave areas. Will it counter-balance high turnout in Remain areas, though? Reports of very high turnout – on pace for near 80 per cent – in Dorset and Leicestershire, both seen as pro-Leave regions. 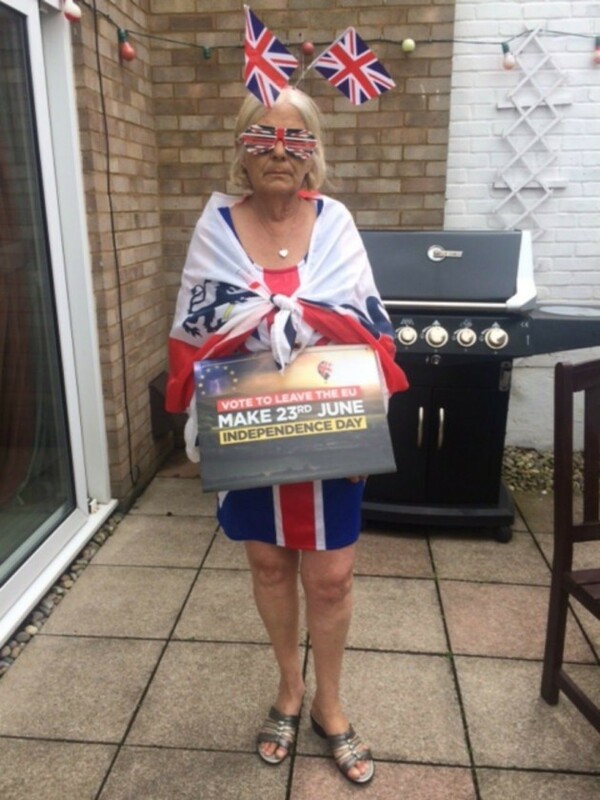 22:26 Chief Counting Officer Jenny Watson hasn’t yet announced turnout for Britain’s EU referendum and this information isn’t expected until midnight, but a spokesman for the Electoral Commission told Breitbart London this evening that it was “brisk and busy at polling stations” today. UKIP leader Nigel Farage expects Remain to 'edge it'. 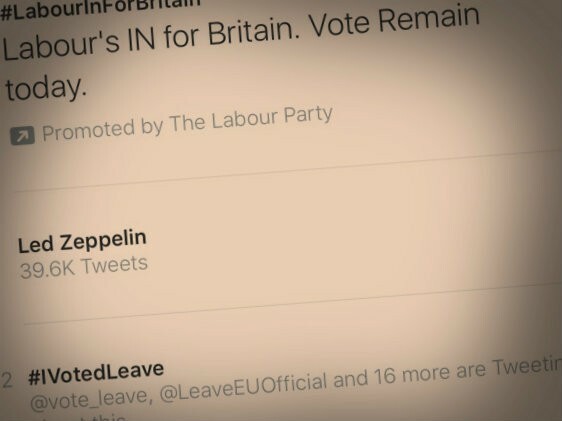 Number one trending on Twitter this evening is the hashtag ‘IVotedLeave’, as thousands of Brits took to the micro blogging platform to express their pride at having taken place in today’s referendum. Other referendum topics are also trending this evening, but conspicuous by their absence in the organic trending ranking are vote remain. 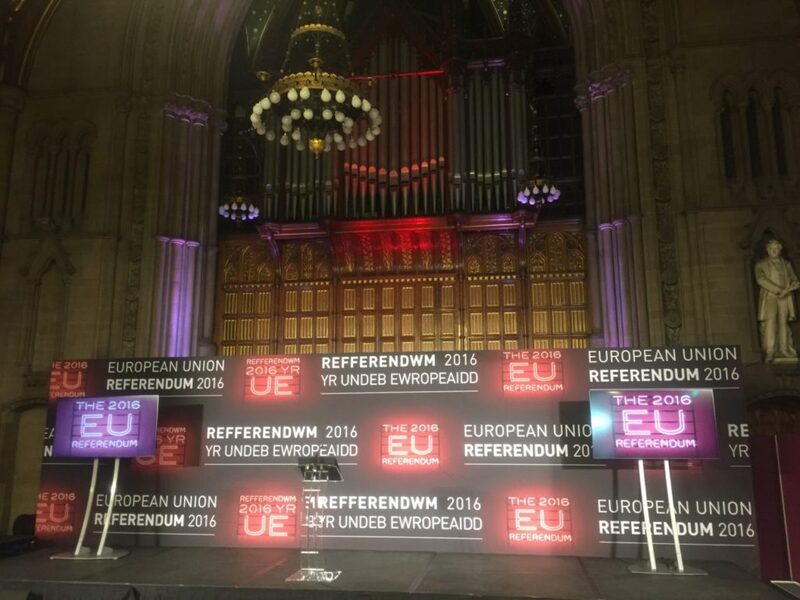 Only appearing by virtue of a ‘featured’ topic — in other words an expensive paid-for promotion — is #LabourInForBritain. 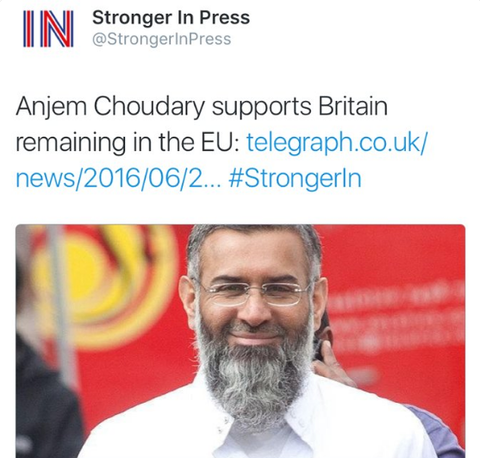 21:12 The number one trending story on Facebook on the day Britain votes on its membership of the EU is radical hate preacher Anjem Choudary lending his support to Remain. Breitbart London broke the story on Tuesday. Read more here. 20:11 The EU referendum is set to be the most bet on political event in British history according to betting house William Hill. Graham Sharpe, spokesman for the company, said they had received wagers not only from the UK but countries across the globe including Japan and Russia. William Hill claims to expect over £20 million to have been bet across the gambling industry with their company taking in 3 million so far. The previous record holder for most bets in a British political event was the Scottish referendum. It took in £20 million but according to Sharpe the industry had met those numbers long before betting closes. 19:48 Last week Sir Bob Geldof and his ship of fools took to the Thames to jeer at Nigel Farage’s pro-Brexit flotilla and his support for the English fishing community and their desire to break free from the EU. 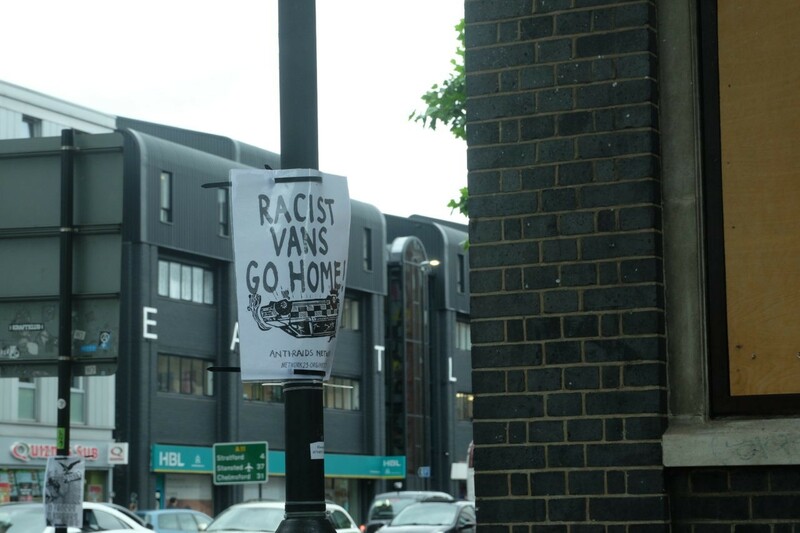 Now it seems one of the passengers onboard with Geldof has had a change of heart. 19:08 A woman in Stevenage, Herts was turned away from a polling station after election officials told her she was inappropriately dressed. Teresa Hicks, 68 was clad in patriotic apparel wearing Union Jack flags and the England flag as a cape as she entered the polling station. 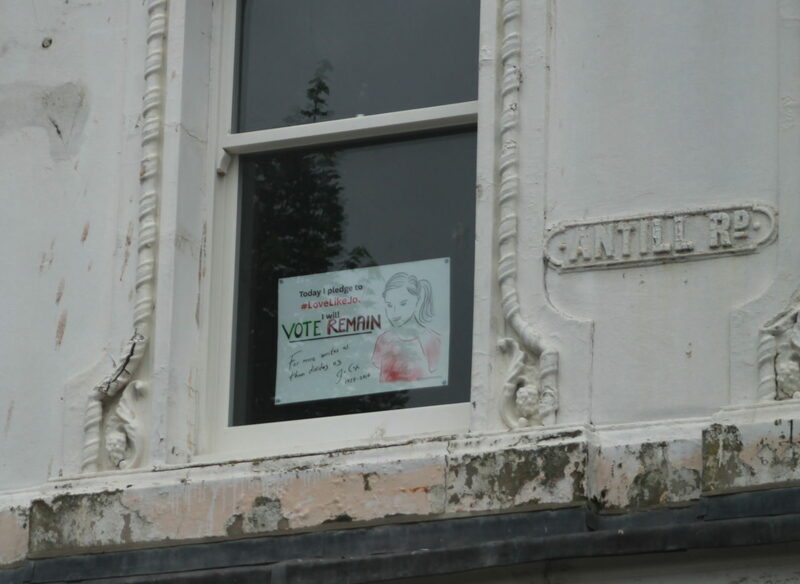 Mrs. Hicks also carried a hand-made Vote Leave sign which the election officials objected to. Officials claim that the reason for turning Mrs. Hicks away was due to her sign rather than her patriotic choice of dress. You can see an image of Mrs. Hicks below and make your own mind up. A Huddersfield polling station was closed by police this evening to “preserve a crime scene” after a man was stabbed in close proximity to the venue, a church. 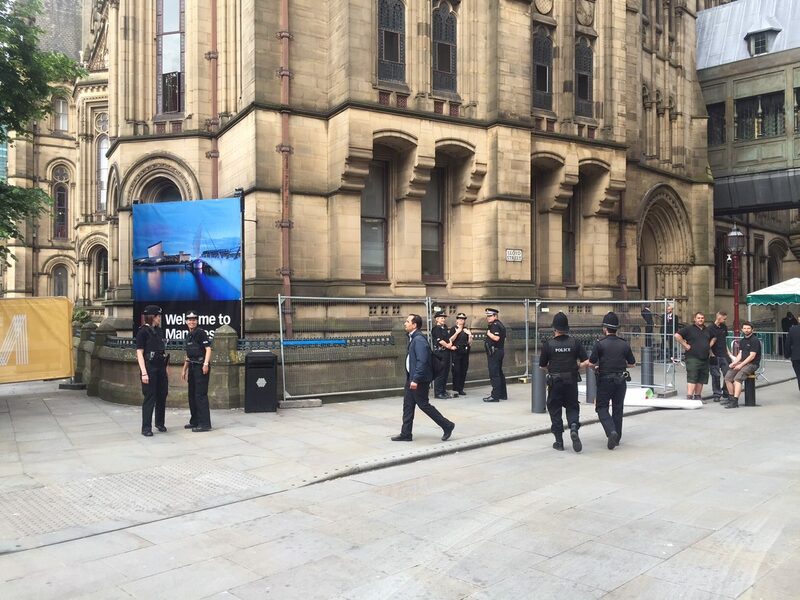 A spokesman for West Yorkshire police stressed to Breitbart London this evening that they didn’t believe the attack was related to the EU referendum. A 19 year old male has been arrested in relation to the attack, but Police refused to release any more details on the man. 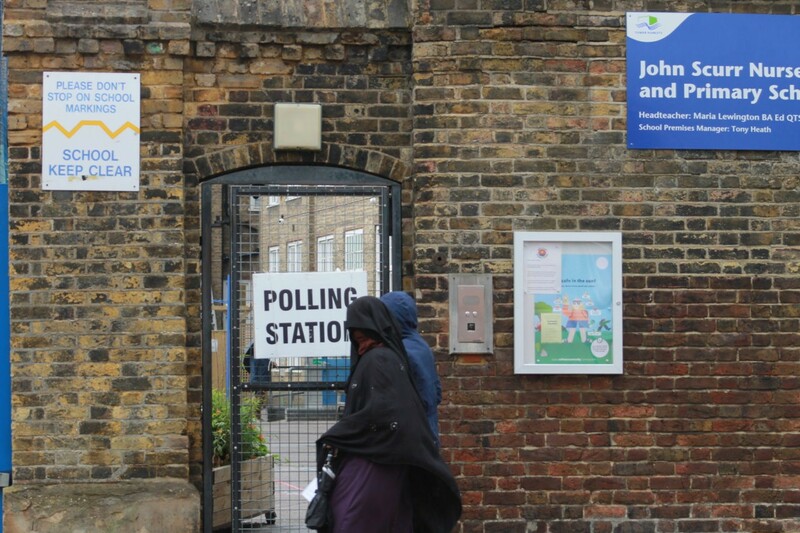 18:05 TOWER HAMLETS, United Kingdom – Perhaps the most “diverse” part of Britain, Tower Hamlets, saw steady voting today as well as questions raised over the proximity of ‘Remain’ activists to polling stations. 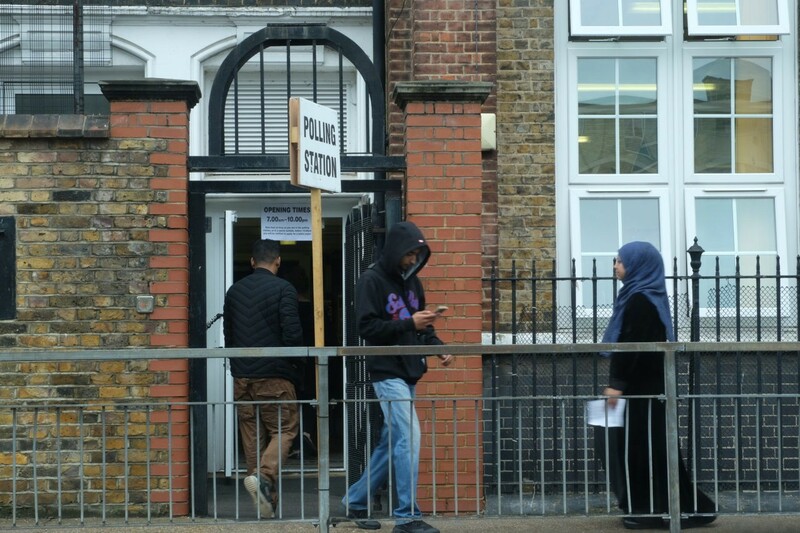 Breitbart London visited half a dozen polling stations in the London borough which played host to Britain’s famous “Shariah patrols”, finding a steady turnout of hijab-clad voters (and their husbands). At one polling station in Tollet Street, we discovered a ‘Remain’ campaigner standing in the doorway of the polling station handing out Remain leaflets to voters. 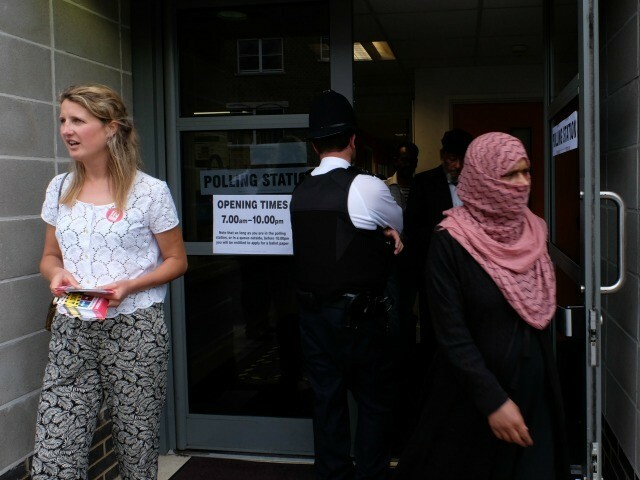 While not illegal, and just a “guideline”, campaigners are usually asked not to stand in doorways where they may obstruct voters. 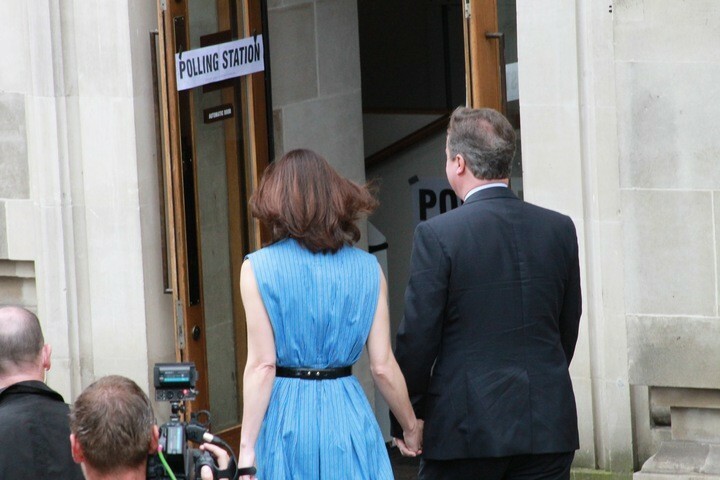 She also told Breitbart London that people who had never voted before were “asking her how to vote”. And local police told us that while at local and general elections there are “issues” related to men standing inside polling station grounds instructing people how to vote, this has not manifested itself today. A selection of images appears below. 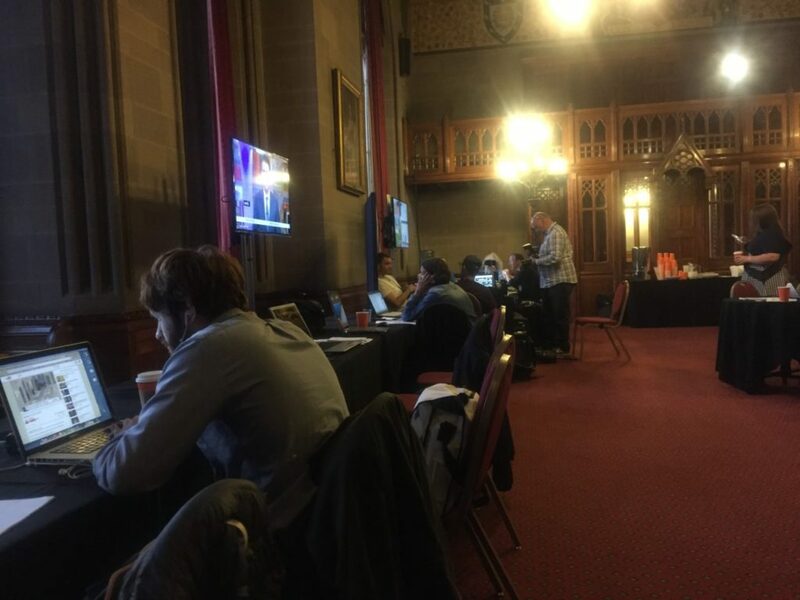 17:52: Breitbart London’s Sarkis Zeronian is in Manchester for tonight’s count at Manchester Town Hall. 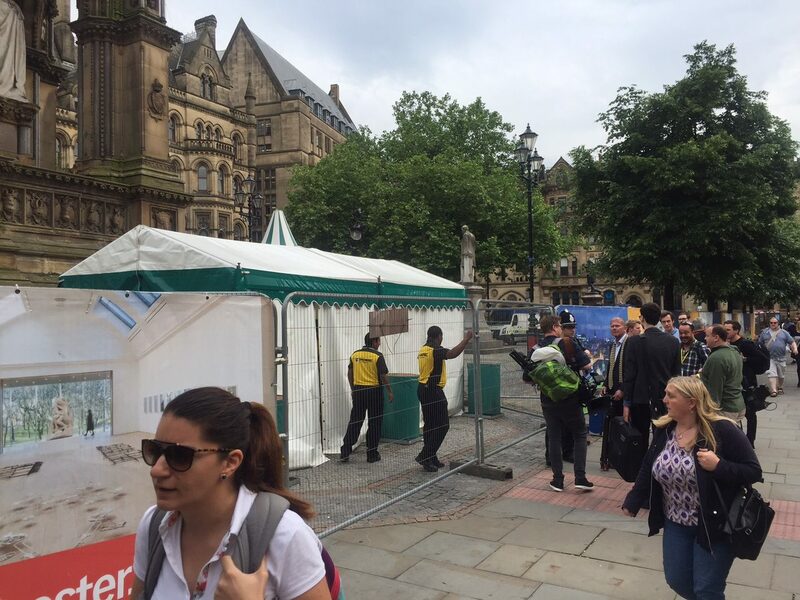 He reports the venue is currently under lockdown for a scheduled security sweep, but some confusion remains between police and others as to when it is supposed to reopen. 11:38 The latest polling numbers have just come through. 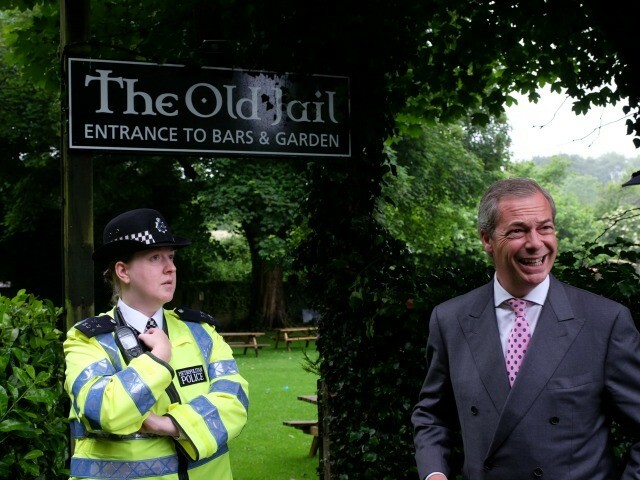 11:23 WESTERHAM, United Kingdom – We’ve just witnessed UKIP leader Nigel Farage voting, just an hour after we saw the Prime Minister in Westminster. Mr. Farage was upbeat and optimistic, though wary that the betting markets are now making Brexit a less and less likely possibility as the day continues. 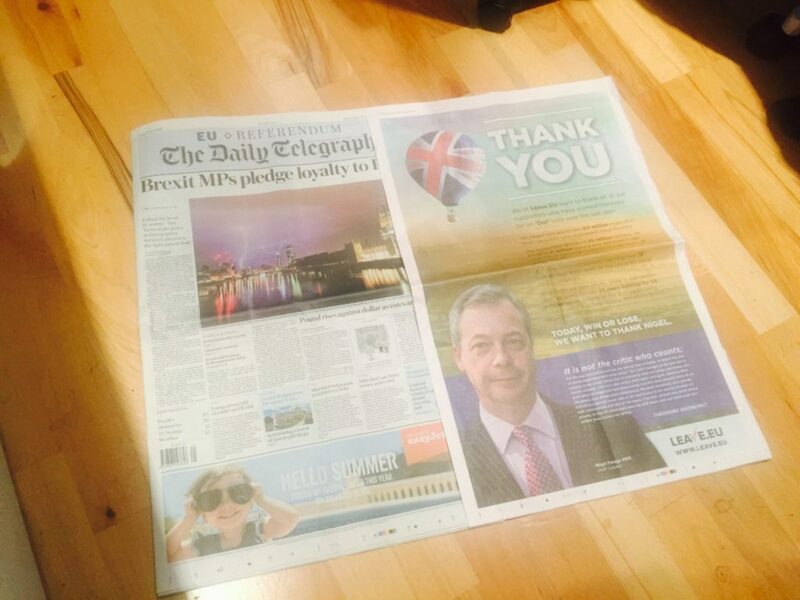 Nevertheless, Mr. Farage told Breitbart London how he’s been waiting for over two decades for this moment and to cast this vote. 11:07 Breitbart London exclusively revealed on Tuesday that Anjem Choudary supports Remain because “there are certain principles and caveats” in EU law that offer “recourse” to Islamist radicals. 10:15 German tabloid newspaper states its case for Remain with offer of sunloungers and various other enticements. 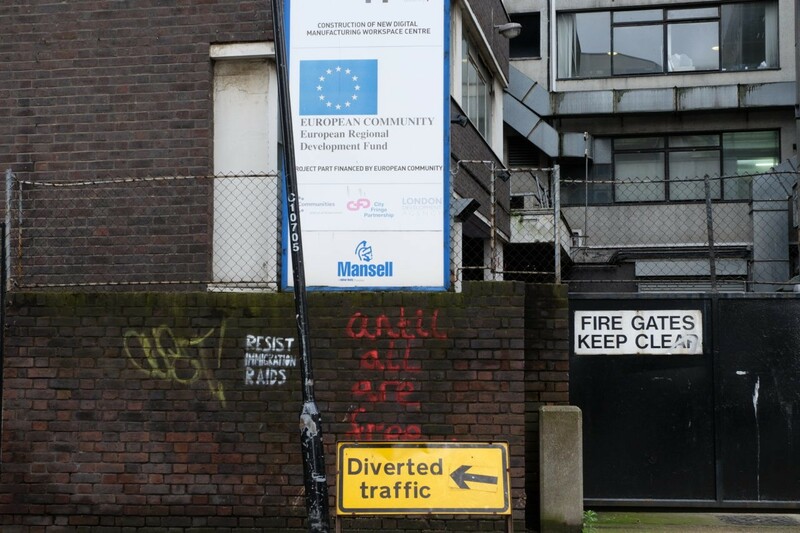 Millions of people across Britain vote Thursday in a bitterly fought, knife-edge referendum that could tear up the island nation’s EU membership and spark the greatest emergency of the bloc’s 60-year history. The once-in-a-generation referendum asks: “Should the United Kingdom remain a member of the European Union or leave the European Union?”. World financial markets, like voters, are in suspense over the result. On the eve of the historic referendum, two polls — both conducted over the Internet — put the “Leave” camp ahead by one or two percentage points, well within the margin of error. 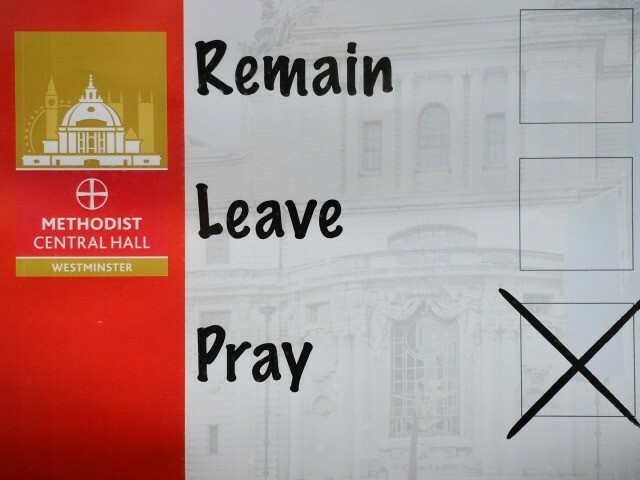 But a telephone poll gave “Remain” a notable lead of 48 percent, ahead of “Leave” on 42 percent. Financial institutions are reinforcing teams to cope with the prospect of frantic trading through the day and the world’s leading central banks say they are ready to react in any eventuality. French President Francois Hollande warned an exit would be “irreversible”. A British withdrawal from the EU would trigger a lengthy exit negotiation, leading to the loss of unfettered access to its partners in the EU’s single market and forcing the country to strike its own trade accords across the world. Thomas Mair, 52, has been charged with Cox’s murder. On his first appearance in court on Saturday, he gave his name as “Death to traitors, freedom for Britain”. A psychiatric report was requested.